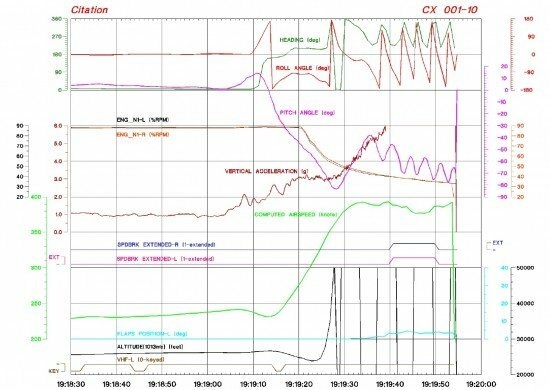 German aircraft accident investigators concluded that a 2010 crash of a Cessna 550B Citation Bravo was caused by the failure of the crew to recover from an intentional roll. On February 14, 2010 the Czech-registered Citation Bravo corporate jet departed Prague International Airport on a night-time IFR flight to Karlstad Airport, Sweden. The copilot was Pilot Flying. While the airplane was climbing to cruising altitude, the copilot asked the captain if she had ever flown a roll at night. The flightcrew started a conversation about performing a roll with Citation Bravo jets. Reaching FL260 the Pilot Flying rolled the 30° to the left and immediately 20° to the right. After that, Munich ATC gave clearance to climb from FL260 to FL330. This was confirmed by the crew. At 20:18 the captain asked the copilot if their altitude was high enough to perform a roll. The copilot confirmed that the altitude was sufficient and he levelled off at FL270. Five seconds later the nose pitched up to 14° and a roll to the right was initiated. Within four seconds the airplane was flying upside down. It rolled a further 90° in the next four seconds. Meanwhile the heading began to change and the nose dropped in an almost vertical dive of -85°. The computed airspeed increased from about 240 knots at the initiation of the roll to 380 knots during the descent. The flight crew were not able to recover and the airplane impacted a forest. The German Federal Bureau of Aircraft Accident Investigation (BFU) stated that the pilots were not trained in aerobatics. Nor was the airplane designed or approved for aerobatics. Contributing to the loss of control was the fact that night-time conditions caused a lack of visual references outside the airplane. The BFU further concluded that the personal relationship between the two pilots led to a lack of professional behavior.